Between genetics, upbringing and social situation, a person's life is often decided by who their family are. With a giant, eternally hungry skeleton monster among her ancestors, Roromiya Karuta might be an extreme example of the idea. She attends school like other kids her age, but also works part-time as a bodyguard after coming home. 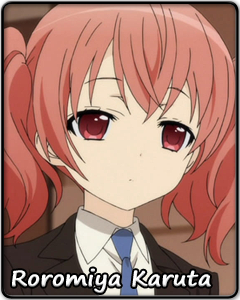 Karuta looks patently harmless in her usual appearance, but not so much in her other, humongous skeletal form. Luckily enough, Karuta does not hunger for human flesh, unlike her ancestor, even if she does suffer from an eternally empty stomach. It is all a lot of trouble, but Karuta does not particularly seem to mind. Her current employer brings her tasty souvenirs whenever he comes back from his trips, and Karuta can eat as much as she wants to without ever putting on weight. With plenty of both human and supernatural friends to have fun with, there is little reason why Karuta should let her unusual background bother her. But even if there were something on her mind, it would be no small feat to pick that up from Karuta's perfect poker face. It is not that she has anything to hide – that faraway look in her eyes is perfectly natural. Guessing what is going on in her head is certainly a challenge, but a challenge worth the effort.